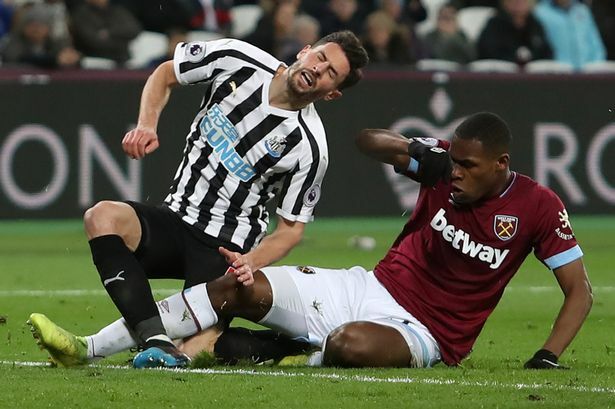 PLAYER RATINGS: West Ham 2-0 Newcastle – One impressive 7, but far too many 5’s & 6’s.. – NUFC blog – Newcastle United blog – NUFC Fixtures, News and Forum. A lacklustre display from Newcastle here, with us making two mistakes at the back and looking pretty toothless in attack on a frustrating night in London. NUFC XI – (3-4-2-1): Dubravka (5) – Schar (5), Lascelles (5), Lejeune (5) – Manquillo (6), Hayden (6) , Longstaff (6), Ritchie (5) –– Perez (5), Almiron (6) – Rondon (6) – SUBS – Diame (7), Dummett (6), Atsu (6). Dubravka – 5 – Could well have come out to claim the corner Rice scored from, however he did appear to get crowded out and blocked off. Didn’t always look assured with the ball at his feet but had little else to do other than picking the ball out of his net and stopping a half decent low shot from Lanzini late on. Schar – 5 – Lost his man Declan Rice too easily for the opening goal and gave away the odd dangerous free kick after over committing. Incisive passing into midfield and out wide at times, also showing impressive footwork at times too, but he was below his best from a defensive perspective tonight. Lascelles – 5 – Cleared plenty ball into the box, was pretty commanding in the air and made a few blocks but was part of a back line that didn’t look quite as settled as it has done in recent weeks. Gave away the odd needless free kick and was guilty of a sloppy pass in a bad area late on. Lejeune – 5 – Started the game looking like his usual calm and composed self, but any good work was quickly spoilt by a needless lunging challenge on Hernandez, giving them a penalty and a 2-0 lead as a result. He and Schar showed their quality on the ball at times, but defensive errors from both have cost us in this one. Manquillo – 6 – I feared for him when I saw he would be up against Anderson, but he stood up to the test pretty well, making a few well timed tackles early on and a few good runs to give us an outlet out wide at the other end. Nothing to write home about, but one of the better players in a bad bunch today for me. Hayden – 5 – Won plenty headers, was combative in the middle and turned over the ball well with a few well timed challenges, but he was a little slow and limited in possession at times, losing it in bad areas to spring West Ham counter attacks. Longstaff – 6 – A few loose passes early – something which we aren’t used to seeing from him – but he quickly made up for that with some brilliant forward passes, picking out Manquillo’s forward runs expertly on more than one occasion. Was withdrawn at half time and looks set to have a knee injury that will be assessed after a clattering 50/50 challenge with Snodgrass. Ritchie – 5 – His energy and commitment to the cause couldn’t be questioned once again, but he struggled at both ends today. From a defensive perspective he struggled to deal with Fredericks’ pace on the overlap, with him often getting in behind him, while his crosses into Rondon were very poor nine times out of 10 at the other end. He swung in a few better balls late on, but it was too little too late by that point. Perez – 5 – A frustrating performance from him today. He had a the odd nice touch or flick here and there in the first half, seeing as much of the ball as anyone in a black and white shirt, but he was dispossessed a little too often. Wasted one of our biggest chances, dragging a shot well wide after being slipped in by Rondon. He was trying to make things happen and involved a lot, but not much came off for him. Almiron – 6 – He had a very quiet first half, struggling to get into it and having a few loose touches, but he came into the game in the second half, carrying the ball forward well and showing flashes of quality and spark. A below par performance, but he didn’t have a great deal to work with on a day where we just weren’t ‘at it’ all over the pitch. 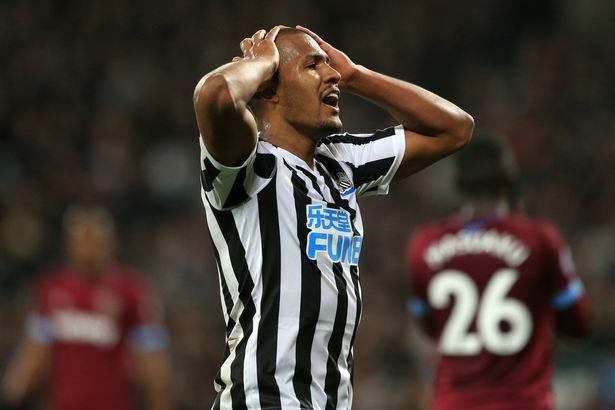 Rondon – 6 – Didn’t get much service at all and looked a little tired tonight for me, but he could still have had a few goals if it wasn’t for the post, a great stop from Fabianski and a few brilliant blocks from West Ham defenders. Diop and Ogbonna generally dealt with him pretty well, but it says a lot about him that he was given so little service for the vast majority of the game but often looked like scoring whenever we put the ball into a good area for him. Diame – 7* – Came on at half time and tried to make things happen, immediately running through their midfield and giving them something to think about. A few barnstorming runs through the middle, the odd shot and one of few players to show some urgency. It says a lot about our display overall today when Diame’s attacking intent and bursts with the ball stood out, with him usually known for his work at the other end of late. Dummett – 6 – Came on at left-back as we reverted to a back four for the final half an hour or so. Did OK.
Atsu – 6 – Was quite lively, being involved in a few decent one-two’s, however things tended to fall flat when it came to his final ball. That’s Atsu, unfortunately.